French poet Rosemonde Gérard said it so eloquently... "Car, vois-tu, chaque jour je t’aime davantage, Aujourd’hui plus qu’hier et bien moins que demain." (For, you see, each day I love you more. Today more than yesterday and less than tomorrow.) Wear your favorite love quote, name, or a significant date close to your heart on this simple textured, mixed-metal bracelet. This one is engraved with, "more than yesterday…less than tomorrow…" This 14K gold and blackened silver bracelet is a sweet reminder of the deepening regard we have for our loved ones with each passing day. 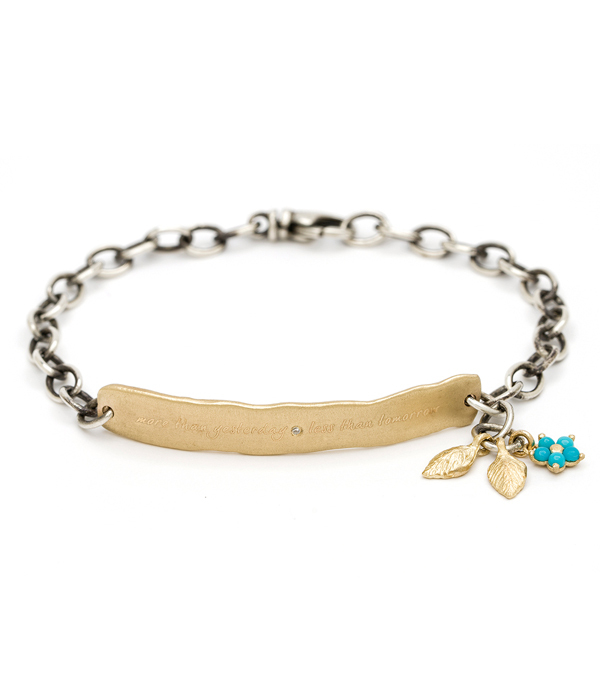 A tiny diamond and two dangling gold leaves and turquoise forget-me-not charm add a sweet and sparkly touch to this sentimental piece. To order this bracelet plain or with your own verse, please call contact a stylist.